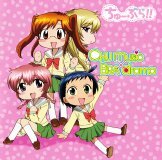 This two CD set contains BGM, songs, and audio drama for the TV anime Chuu Bra! (ちゅーぶら！). The first CD is the soundtrack containing the TV size versions of the opening and ending songs, and many tracks of BGM. The second CD contains two tracks of audio drama. Songs by Chihara Minori (茅原実里), Kotobuki Minako (寿美菜子), Yahagi Sayuri, Hikasa Youko (日笠陽子). The audio drama tracks are as follows.